It’s clear that the V&A have spared no expense in their latest show Christian Dior: Designer of Dreams, which is the first exhibition I’ve been to in the new subterranean gallery. There’s a garden grove decorated with thousands of handmade paper flowers, carefully presented showcases holding 70 years-worth of archival material, and a spectacular ballroom complete with animated walls that morph into the night sky. 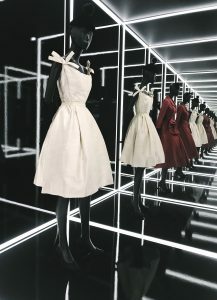 It’s a beautifully curated experience, with a thematic rather than chronological approach to Dior’s creative excellence. As with all of the V&A’s exhibitions, this is more than just a room full of pretty dresses. There’s a detailed and carefully considered insight into Dior’s design process, and the many steps that take place between conceiving an idea and producing an exquisite outfit. 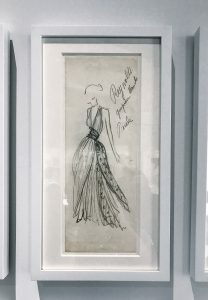 There are fabric designs and model sketches showing numerous references to Dior’s inspiration, amongst them the lavish court style of Versailles in the 18th century and his mother’s garden. The room dedicated to the ateliers is exquisite–a high-ceilinged gallery where beautiful white prototypes stand testament to the extraordinary work of the seamstresses who bring the creative vision of the designer into the physical world. There’s also a gorgeous room where miniature dress mock-ups are displayed alongside hats, shoes, costume jewellery, illustrations and full-size gowns. 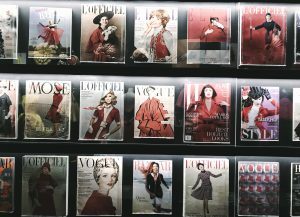 This space, complete with an entire wall of the magazine covers which have featured the work of Dior, was my favourite part of the show. There’s an interesting room titled ‘Travels’, which is sure to invite some commentary on cultural appropriation in fashion today. 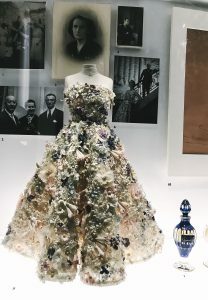 Dior was widely travelled as a young man, and often took inspiration from the architecture, landscapes, art and textiles of the different places he visited, naming dresses after the places that inspired them. The gallery showcases five countries that inspired Dior and his successors (Mexico, Japan, Egypt, China and India), but is at pains to acknowledge that the line between creative inspiration and cultural appropriation can easily blur. The interpretive panel notes how the 21st century has been defined by growing calls for equal representation and cultural respect, and how the internet has been instrumental in demanding that the fashion world be more considered and conscious in drawing inspiration from other cultures. Dior: Designer of Dreams will definitely attract those who know their H-line from their A-line, as well as those with serious fashion nous. But the show is also broadly appealing and accessible for those with no real knowledge about the designer who just want to spend an afternoon immersed in beautiful design. 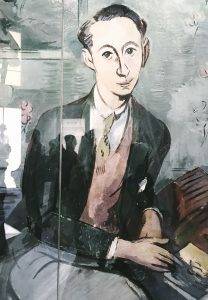 Unfortunately, I didn’t see any children’s interpretation, which was a shame–unless there’s a children’s guide that I missed, this exhibition might detract family visitors from spending £24 per adult. At times the experience can feel quite corporate, as the exhibition explores the evolution of the brand with nods to its founder. It has quite a different feel to the Balenciaga: Shaping Fashion show which drew heavily upon the V&A’s archival collection and demonstrated Balenciaga’s transformational impact on fashion and design, whereas Designer of Dreams features a lot of loaned material that emphasise the position and clout of the brand today. Having said that, the exhibition was highly enjoyable and well-executed. The event series looks like fun, with everything from a fashion illustration course, talks on the history of millinery and embroidery workshops. 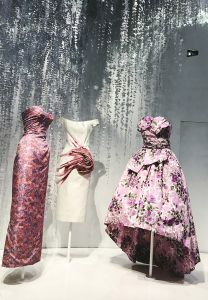 The V&A have created a world worthy of Dior, and I’d recommend it to anyone with a love of fashion and design. 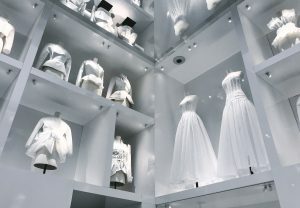 Christian Dior: Designer or Dreams is now showing until Sunday 14 July at the V&A Museum.